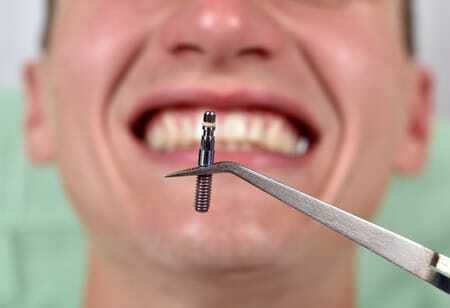 Dental implants are by far the best option for replacing missing or severely damaged teeth. As opposed to traditional tooth replacement options, dental implants are placed directly into your jawbone giving them the same strength and functionality that you would get from your natural teeth. Once any necessary preliminary procedures are finished, the dental implant procedure can be completed in one visit to the dentist, but in most cases, and for the best results, it will require 3 visits over a period of several months. Here we have put together a detailed explanation of what will happen at each stage of the dental implants procedure so that you know what to expect. The reason why our teeth are so strong is due to the part of the tooth that is not visible; the tooth root. Surgically inserting a titanium dental implant into the patients jawbone is thus the most important step in the overall tooth restoration process. In this step, the periodontist will begin by giving the patient local anesthesia to reduce any pain. They will then cut open the gum tissue surrounding the area where the implant will be placed and drill a tiny hole directly into the jawbone. This hole is then plugged with a titanium post or screw which will act as the root for the dental crown that is placed in the final stage of the dental implants process. Once this stage is complete, the periodontist will stitch the gum tissue in order to cover the implant so that it can heal properly and to avoid any infections. Usually a removable crown will be given to the patient for aesthetic purposes and to eliminate any biting forces on the implant site. It can take up to 6 months for the implant to osseointegrate with the jawbone before it is ready to be fitted with the final touches. When the dentist determines that the implant has fully fused with the surrounding bone, a second minor surgical procedure is required. In this stage, the dentist will once again cut open the gum tissue surrounding the implant so that an abutment can be placed on the implant. An abutment is the connecting piece which allows a prosthetic tooth to be secured to the titanium implant. Once it is attached to the implant the gum tissue is stitched up and given about a week or two to heal before the final stage. In the final stage the patient will be able to walk out of the dentists office with a brand new fully functioning tooth. In this stage the dentist permanently attaches a custom made dental crown to the abutment, making it look and feel just like any other natural tooth.